If you've never played or never heard of Keno before then you can find everything you need to know about this popular gambling game here. The gambling game Keno is a lottery-like game popular in many modern casinos and also sometimes offered as a game by some lottery operators. Players play by choosing a series of numbers ranging from 1 up to 80 (although some game operators may differ). Once all the players have placed their wagers, 20 numbers (again some operators may draw fewer) are randomly drawn, either from a machine holding numbered balls (like Bingo) or using an electronic random number generator (RNG). Each casino or operator of a game specifies their payouts, known as "playtables". The player is paid according to how many numbers were chosen, the number of matches, and the amount wagered. If you want to learn how to play standard Keno, available in many casinos, restaurants and even online, then follow the simple steps below. Get a Keno card available from the Keno lounge in the casino. It will be marked with 80 numbers in rows of 8 by 10 columns. Some game operators may offer different cards, including jackpot and bonus cards. Now mark the numbers you want to choose. The card should tell you how many you are allowed to select. The marked numbers are known as "spots". Some cards allow you to play anything from 1 to 10 numbers, while others may say anything up to 20. The cost is the same for any amount of numbers or spots you choose. You may also choose to have your numbers chosen at random (known as a "quick pick") and the operators computer will do it for you. The odds of winning are exactly the same as if you manually select your own numbers. Decide how much you want to wager on your chosen numbers and how many Keno games you want to play. You do this by marking your Keno card. Your minimum wager may be as little as $1 and usually up to $20 but it may vary depending on where you're playing. A player may wager on groups of numbers within the same game by using a "way" bet. This can make things complicated and difficult to keep track of. Hand your keno card to a keno worker who will issue you with an electronically produced copy of your card so you can follow it as the numbers are drawn and announced. Now watch the Keno machine as it randomly selects 20 numbers. The numbers will be displayed on electronic boards throughout the establishment so you can wander around and keep track of your game. The game number you're playing will be printed on your ticket copy and on the electronic Keno board and will usually be found in the bottom corner. Check whether you have any matching numbers on your ticket with the numbers selected by the machine and if you do, you win. How much you win depends on how many matches you have and how much you wagered and also how many tickets there are in each game. You can ask a Keno worker to help you out. Different operators offer different payout rates but it is possible to make tens of thousands from a single dollar bet. Typically the operator will payout below 70% to about 80%, which isn't that great odds in a casino game. If you have matched numbers then call over a Keno worker to declare your winnings. 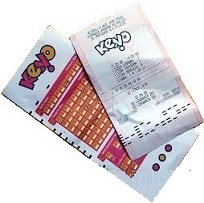 You'll have to submit your Keno ticket for verification but once it is confirmed you can collect your winnings. You can then play the next game which should start around 5 minutes later. It's played constantly non-stop. Payouts are based on the number of numbers matched (or "hits"), the number of numbers chosen and the amount wagered multiplied by the "base rate" of the paytable. Typically the more hits the greater the payout although it isn't uncommon to have payouts for no hits at all out of 20. The odds of a player hitting all 20 numbers on a 20 spot ticket is over 3.5 quintillion (1 in 3,535,316,142,212,174,336 to be exact) to 1 which is virtually impossible. Casinos often payout for 17, 18, and 19 hits the same as for a full 20 hits. Lower numbers of hits are very possible. Odds of winning change considerably for the more number of spots on each ticket.